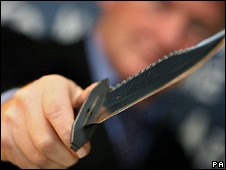 KNIFE MURDERS LAW CHANGE - Ann Oakes-Odger MBE successfully achieved the Schedule 21 Review of the Criminal Justice Act 2003 resulting in a new starting point Tariff of 25 years which increased the Minimum Term for 'Knife Murders' from 15 years to 25 years...effective 3rd March, 2010. 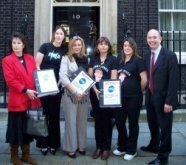 WESTLEY'S WEAPONS AWARENESS - Preventative Education in Schools in the UK...recommended to Government by the Home Affairs Select Committee in 2009! the legal system treats Knife Crimes less seriously than Gun Crimes. The Petitioners therefore request that the House of Commons urge the Home Secretary to introduce legislation so that the carrying of Knives and the use of Knives, and Sentencing Policies, are treated on the same terms as Gun Crimes." 27th March 2007 - 1st Home Affairs Select Committee...'Knife Crime Debate' supporting the foregoing Petition. The Written Memorandum submitted by Ann Oakes-Odger to the Select Committee can be found on the 'Knife Crime Resource' - (left of page). which echoed Ann's successful campaign!" loss of a loved-one in this way. following a row over £50 and a mobile phone! 26th November, 2009 - Home Affairs Committee, Knife Crime Seminar... took place in the Attlee Suite, Portcullis House. The Cross-Party Panel - Rt. Hon. Keith Vaz MP (Home Affairs Committee Chairman), Bob Russell MP, David Hanson MP, Crispin Blunt MP, Paul Holmes MP. To update on trends and initiatives - Chief Constable Keith Bristow (Warwickshire Police), Head of the Tackling Knives Action Programme (TKAP) and Chief Constable Alf Hitchcock (National Policing Improvement Agency), Knife Crime Lead for the Association of Chief Police Officers. The Chair opened the discussion in the folllowing subject areas, with attendees. * Do we agree with the analysis contained in the Report? * Do we agree with the solutions proposed? * Has anything changed over the last six months in terms of trends and solutions? * How can we re-focus existing funds in the most effective way? "Let us be clear, if you carry a knife our objective and determination is that you will be prosecuted; you will be punished...but we want to do all in our power also to prevent anyone carrying a knife in the first place." "Enforcement, punishment and prevention together!"